I’ve become a fan of Platypod Ultra. It’s got all the best features of the original Pro and the larger Max, and it fits in my back pocket. It goes everywhere I go from road trips to long hikes. I use it in airports, cities, and other places tripods just aren’t safe to use. Let me show you some of the ways I’ve been employing Ultra in my photography and you’ll see that you should have one, too. This is an easy way to use Ultra, and since it’s small and light you can have a solid platform for your camera with you all the time. There’s no excuse to not be in the group portrait. This is my city’s leadership class and I was a student as well as the class photographer so I set the timer and jumped in the picture. Using Platypod Ultra makes your pictures better not only because it stabilizes your camera like a champ, but also because it stimulates your creative mind before you begin shooting. Simply finding places to put Ultra is a fun exercise and requires imagination. In this case, I jammed it into a crack in a rock in the desert. You’ll find cracks all over the place once you start looking, and they’ll offer a unique perspective to what you usually see with your tripod. Look for cracks in stumps, brick walls, gaps in fences, eaves of houses, doors of cars, etc. Ansel Adams is quoted as saying that getting a level horizon is the hardest thing about photography, and I believe it. In this instance, I used the included spike feet to level my camera on the steep incline on the face of this monolith. Having the base level made it simple to keep the camera steady and centered, and it allowed me to get nice and close to the rock so I could use the foreground as a separate subject. At Portland, Oregon’s Japanese Gardens, you must pay $5 to use your tripod in the park, and even then it’s not allowed on the mossy ground cover or on rocks. You and your tripod must stay on the paved pathways so that you don’t damage the meticulously manicured landscaping. As you can see in this first photo, the famous Laceleaf Maple tree has a small fence around it which keeps your tripod from getting very far under the branches. Ultra won’t poke the turf like a tripod and you can get it right down under the branches for a much more striking wide angle perspective. You’ll find all kinds of places, like museums and cathedrals, where tripods are banned, but Ultra is allowed. It’s like having a backstage pass at your favorite concert. Tripods aren’t allowed on moss or rocks or passed fences. This is not a bad view of this famous tree, but I thought I could do better. Ultra isn’t a tripod and won’t damage the mossy ground cover like a tripod’s feet, so I was able to place it closer and lower and get much more movement in the picture. Now that the camera is as low and as close as needed I got the better perspective. I don’t want you to think that I mean Ultra replaces a tripod because it doesn’t. It simply gives you the stability and utility of a tripod in a small package that is easy to carry along. In fact, I often save weight and space by using the same ball head on Ultra and my tripod. In this picture, you can see that Ultra is attached directly to the tripod using one of the tapped holes in the surface. These holes are 1/4″-20 and 3/16″-16, which are the standard sizes for tripod connections worldwide. My ball head is then attached atop the Ultra. remove the Ultra with the head attached and I’m always ready for those shots with an improved perspective. I’m using the Vanguard TBH-50 ball head, which comes included with the Vanguard Veo tripod series, which is also pictured; it’s my favorite head and it’s Arca-Swiss compatible. Tripods hold the camera in the center of the legs as they spread out, and that means you can’t get close enough to a railing on a bridge to see over and shoot downward. Ultra, however, just straps right onto the railing and then you add your camera for the best perspective. You can even use Ultra on a railing to make panoramas, as I did for the second photo. I used my belt to strap Ultra to the bridge. Be sure to secure Ultra in place before adding your camera and it’s best to use a second line tied to your camera independent of the strap holding Ultra. This perspective isn’t possible with a tripod. This vertical Panorama isn’t possible with a tripod that’s too far from the railing. Once you begin looking for places to mount Ultra you’ll start seeing opportunities all over, and they are often better than you could do with a tripod. For this waterfall, I couldn’t have gotten my tripod as close to the water without having the railings in my shot, and it would have obstructed the view for several other people which is bad form in this introspective area of the Japanese gardens. Take Ultra walking and hiking and you’ll start seeing pictures you wouldn’t normally consider simply because you know you’ll be able to get the camera in a good spot. I tuck it in my back pocket, or in the belt of my backpack. I take a lot off road trips–at least one each month (I just drove 2,500 miles with the kids last week)–and the best advice I can give you for making pictures on road trips is to be quick. If you take too long, your companions won’t be happy and you’ll never get where you’re going. Ultra lets me make many stops because it’s so fast to use. I keep it on the seat next to me with the camera already mounted so there’s no time lost getting the tripod from the trunk. There are no legs to expand and collapse, so it’s nimble enough to make several distinct shots in a hurry. 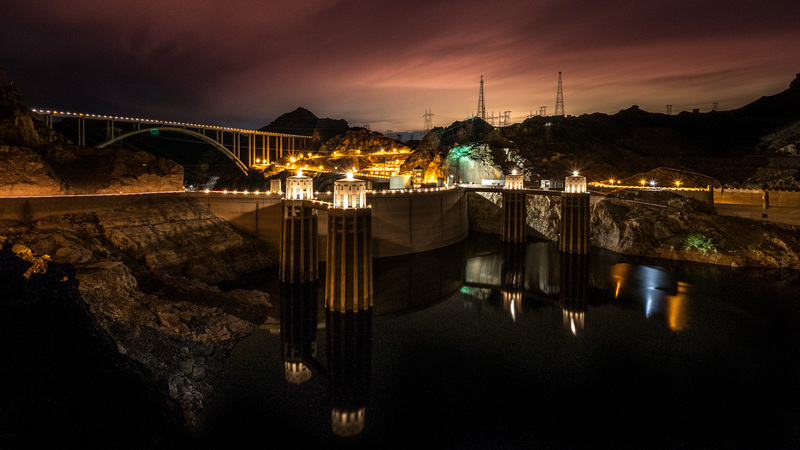 You can even sneak a stop in at Hoover Dam as you pass by at nighttime (I’ve got to go there in daylight sometime). You’ve seen that Ultra fits in places tripods don’t. Here’s another example. Hiking in the Columbia River Gorge you’ll find that the edges of cliffs are not really solid rock, but are covered with moss and plants–and they’d make a great photo. You can see that a tripod would fit here because the legs would need to splay out over space. If I shot this flower again, I think I’d use one or two of the spike feet to secure the Ultra a little more like tent pegs in the dirt. More security is always good when your camera is teetering over a precipice. By now you probably understand that Platypod Ultra goes low really well. But it’s amazing that it goes vertical when it’s this low, too! I like to use the riser that comes in the Accessory kit for this kind of shot, but not all cameras and ball heads will need it. It’s just incredibly stimulating to realize that you can use all kinds of perspectives to make your pictures meet your vision. I wanted to show both the majesty and the environment of this Balancing Rock in Valley of Fire State Park. Sitting higher on the tripod just didn’t get enough impact with the 25mm lens on my Lumix camera. I wanted to remember this rock like one of my favorite lines from Desert Solitaire as if I were crawling through the desert on my belly in order to get the full experience of it. Plus, it held the camera still enough for HDR brackets long after the sun had set. At Photofocus, we’ve partnered with Platypod to help them get the word out about this terrific new tool. We’ve helped develop its new features, and we use it ourselves all the time. I personally think it’s one of the best photography tools under $100. I recommend that you go to Platypod’s Kickstarter page and pre-order right away. Personally, I use the Ultra and the Max both all the time, and there’s a package deal that includes those two. That’s what I recommend. I also like the accessory kit with the longer 36″ strap–that allows you to keep your pants up and hang Ultra on bridges at the same time 😉 It’s a good deal on Kickstarter. Maybe there’s a dad in your life who could use one for Father’s Day, or maybe there’s a woman in your life who’s made you a better a dad. I recommend this tool and I know you’ll find many ways to employ it and make your pictures better.